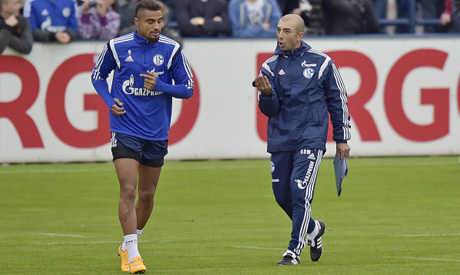 Schalke 04 released midfielder Kevin-Prince Boateng and striker Sidney Sam on Monday following the 2-0 Bundesliga defeat by Cologne which put their European place for next season at risk. Sports director Horst Heldt had warned there would be consequences after Schalke, who reached the Champions League knockout stages this season, lost in Cologne on Sunday. They have managed only one win in their last eight league games. "Kevin-Prince Boateng and Sidney Sam have been released with immediate effect," the club said in a statement. "Marco Hoeger is suspended from training and matches until Saturday." Schalke have dropped to sixth in the Bundesliga with Borussia Dortmund and Werder Bremen now only two points behind. Boateng, a former Ghana international, and Sam, who has won five caps for Germany, were among the top earners at the Ruhr valley club. But Sam has started only seven league games this season since joining from Bayer Leverkusen and has failed to score while Boateng has been criticised for below-par performances.